How to make Watermelon Treat Bag filled with candies! Easy to make with the Sizzix Big Shot and fun to give a handmade gift. Easy DIY Craft Tutorial Idea. One of my favorite people at work is changing jobs and moving out of my department. I wanted to give her a little something to show her how much I am going to miss sitting next to her every day. 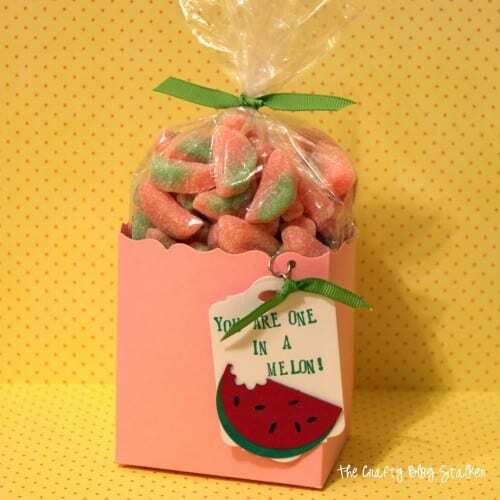 One of her favorite candies are the Sour Patch Watermelon Candies so this cute Watermelon Treat Bag was the perfect fit. My favorite part of the goodie bag is the tag that says – You are one in a melon! This was a really quick craft and something you could easily duplicate. Supplies Used: Some links may be too similar items when exact items couldn’t be found online. Feel free to change the supplies to accommodate what you already own. These are just the supplies that I used. *This Fancy Favor Bigz XL Die is no longer in production but you can find similar dies for use in the link above. The bag was made using the Fancy Favor Bigz XL die and Big Shot. I used a light pink cardstock. The die even scores the fold lines so all you have to do is fold and put some glue on the bottom tabs and your bag is made. For the base of the tag, use the Big Shot and Chalk Talk framelits dies. I used 2 jump rings to attach the tag to the bag – 1 for the tag and the other on the bag and hooked them together. Pour them into a food-safe cellophane treat bag and tie it up with a piece of green ribbon. I added a matching piece of ribbon on the tag as well. Isn’t it so cute all put together? I hope she likes it! Who would you give this fun little treat bag too? SAVE THIS YELLOW WATERMELON TREAT BAG TO YOUR FAVORITE DIY PINTEREST BOARD! Hi Katie,Thank you!! !This is a great idea as a table present for my next party!! !Very nice!! !Have a happy week!!! Love this project!! Great for parties! … one in a MELON…. HA! That’s my favorite part! Such a cute project! The recipients are going to love this! This turned out so cute Katie! 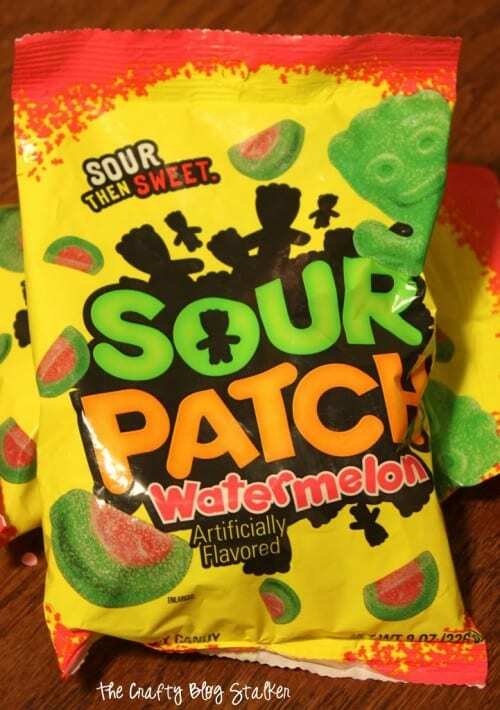 Ok, now I am craving sour patch kid watermelons like CRAZY!!!! 🙂 Fun project! Super cute! I love this idea. I love that you made the bag too! And I totally love the one in a melon saying! So clever! Very cute! I love watermelon stuff- perfect for summer. I’m pinning for later. Thanks. Love it, I think its a little difficult for me, but I’l try! Pinned it. I LOVE this! Pinned, and following you on Bloglovin’. Thank You so much for linking up with the Friday follow along. I love the stuff you post! Way cute! Oh this is so cute – I just love Watermelon themed ideas for the summertime! A very cool treat bag..I love the watermelon gummies!